Have y'all had a good week so far? Mine has been much better than I was expecting being that it's the first week back after Spring Break, however, exhaustion has definitely hit! My flight didn't come in from Orlando until late Sunday night, which made for an early morning on Monday. Surprisingly, I breezed through Monday and Tuesday (likely running on adrenaline alone) and then exhaustion hit big time Tuesday evening. That being said, I haven't even added pictures from my trip to the computer yet and am still getting all my ducks in a row since being home. I have some great posts in the works, but, honestly just don't have the energy to put them all together. After my last post, Resolutions Update and an April Fool, many of you asked how I've managed to lose 18 pounds. I thought today I'd share what's worked for me and some basic tips I've picked up. This will be a text heavy post, so I've tried to add in some Pinterest inspiration along the way and apologize now if I bore you! Bryce and I met during my 4th year at UVA. I am naturally a brunette. I was a psych major in college. Surprisingly, most of y'all guessed right; the lie was #1! Bryce and I did not meet until the summer after my fourth year through mutual friends here in Richmond. Here is a link to the first post I ever mentioned him in, and if you scroll through "Newer Posts" from there, you'll find a recap of the early days of our romance. I can't believe it was nearly 2 years since that first post and since first meeting my B.
Additionally, I'll mention the other 2 truths. I am naturally a brunette-kinda. As a little girl I was blonde, but during high school my hair gradually changed into a dull brown. I was born a blonde, and therefore think it's in my soul (ha! ), but technically now would qualify as brunette. And secondly, I was a psych major in college and also earned my Masters of Teaching while at UVA. Okay, now onto the nitty gritty: losing weight! I started the post with that picture because it really has proven true for me. Around a year ago, I tried to start losing weight, pretty much by working out alone. I saw virtually no results! I may have firmed up a bit, but as a whole, working out alone was worthless. This time around I changed my diet and the first 5 or 6 pounds fell off without setting foot in a gym. I started slow: Sometime around the end of November or early December I cut Cokes out of my lunch. I only drank one of the small 90 calorie cans each day and always justified it telling myself "It's only 90 calories!" But what I didn't think about is what makes up those calories--sugars, chemicals, caffeine! I switched to water, and usually add some lemon slices to it for flavor! I also began focusing more on my body's natural cues at that point. I had gotten into a really bad habit of overeating all the time. Rather than eating until I felt comfortable, I ate until I was overly full and usually felt like I was going to burst. 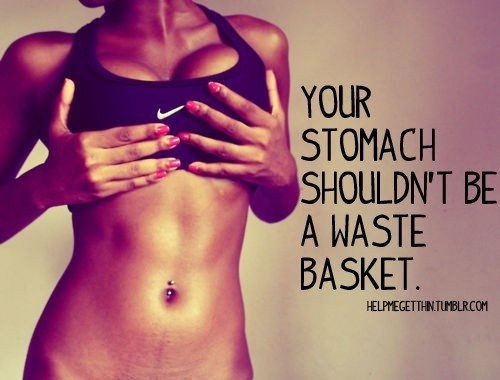 With just these two simple changes I lost the first 5 or 6 pounds-- it was painless! I was thrilled by those first pounds that came off, however, I knew that those simple changes weren't enough to reach my goals. Once the new year began, I knew it was time to take it to the next level. First things first, y'all know I'm a Southerner and you know how we Southerners eat. We love our comfort food. As stated in my bio on the side, mac and cheese is and will always be one of my favorite foods. However, I knew I needed to take a step away from the comfort foods (carbs in particular) if I wanted to see real and lasting results. I should start my explanation of that low carb diet bullet with: "Hi, my name is Allie and I'm a recovering carbaholic." I LOVE carbs--my favorite food is by far pasta and I love carbs in just about every form. Now, however, pasta dinners are more of a reward, rather than the norm. I also have been more strategic when it comes to carbs. I knew that a zero carb diet just wouldn't work for me, so now I focus more on adding complex and gluten free carbs to my meals (especially polenta!). Additionally, I have really cut my sugar consumption down. At the beginning of March I did a two week sugar free cleanse to boost metabolism and curb cravings. I've found that when you break the habit of eating things like sugars, the cravings tend to go away. Not only have I cut back on sweets, but also sugars in many different forms. For example, I switched from Honey Nut Cheerios (9g sugar/serving) to Rice Chex (1 g sugar/serving) for my morning cereal and cut my lemon yogurt out of my lunch (13 g sugar). I also cut sodas out completely about 2 months ago (aside from the occasional cocktail with Sprite). When I initially started, I still allowed myself Coke when out to dinner or after a particularly long day, but now I don't drink it at all! You'll notice the salad is the biggest portion on my plate! 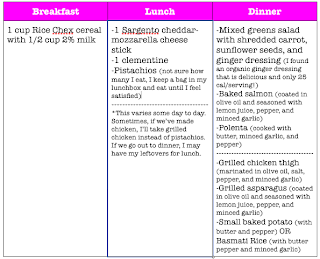 Now to give you an idea of what all this "low-carb, low-sugar, reduced portion size" mumbo jumbo means, I'll share a typical day's eating with you! I decided to include two dinners for a bit of variety! 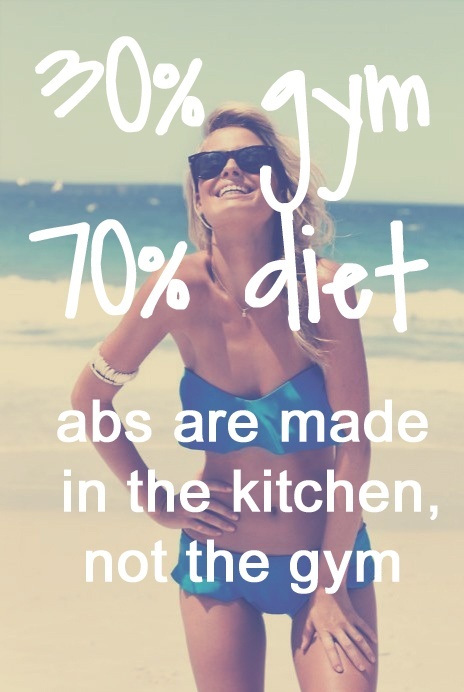 Like I mentioned before, 70% diet, 30% exercise--if you eat well, working out is more for toning! This has been key. 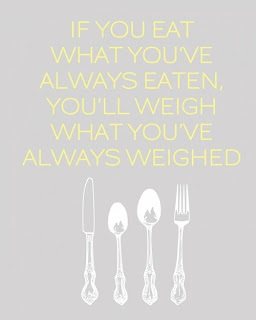 I strongly believe that my changed eating habits are not a diet, so much as a lifestyle. HOWEVER, you'll never be able to maintain a healthy diet if you don't allow yourself some leeway. People who limit themselves completely are more likely to give up or get to a point where they binge after depriving themselves for too long! I'm a firm believer that most everything is okay in moderation. 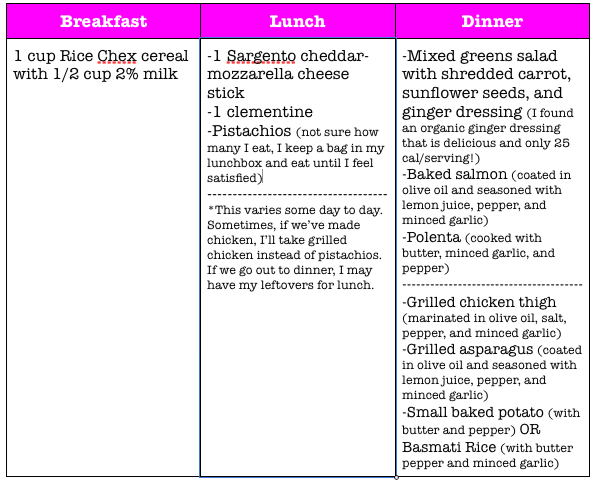 I eat somewhat bland cereal 5-6 days/week for breakfast. BUT, you better believe I indulge on the weekends! Brunch is one of my favorite outings. On weekends I allow myself chocolate chip pancakes, waffles, or cheesy omelets for breakfast! Additionally, when I'm out to dinner, one of the last things I'm ever going to order is a salad. Going out to dinner is a treat and if I'm at a restaurant and pasta is the best sounding thing on the menu I'm going to order it! And finally, if I really want ice cream, I'll stop and get some (usually kiddie size, though!)! Finally, none of this would be possible without a big dose of motivation! For me this motivation came largely from clothes (are you surprised?). For close to a year and a half, I had a closet full of beautiful, but unwearable clothes. I went from a size 6 to a 10 and felt defeated almost every time I looked in my closet. I finally got to a point where enough was enough. I wanted to regain possession of my closet, and also a lot of my confidence. Fitting into smaller sizes has kept me going. I'm proud to report that I can now fit in probably 99% of my clothes again and it feels great! Yesterday was class picture day at school and I felt so triumphant when I was able to wear a favorite Lilly! I used to laugh this quote off, but now, I'm all for it! I still have 7 pounds to go to reach my goal of losing 25 pounds, but I'm not dreading it--I'm excited about what is to come! My next steps are to continue what I've been doing and try to up my workouts a bit, as well as add more tone/definition to my arms and abs. Do you have any weight loss tips? 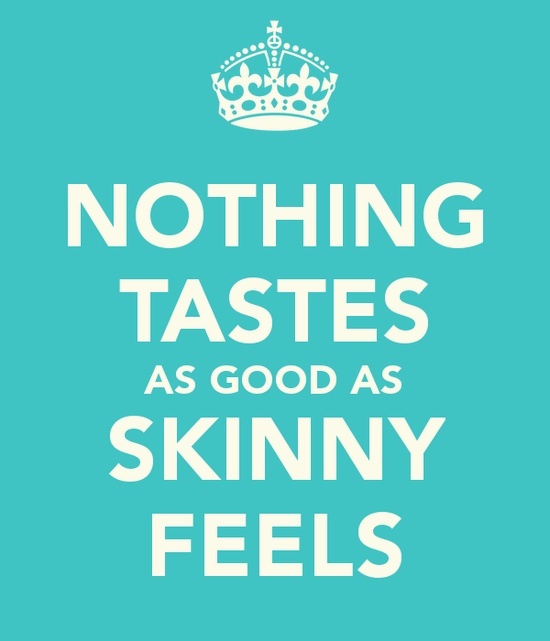 What is your motivation for staying skinny? Have a great day....tomorrow is FRIDAY! I am so proud of you!!! This post was so inspiring! I struggle too with overeating and I've been trying lately to have around 75% veggies and 25% meat on my plate and it's not easy! I'm glad summer is coming though because that means all the vegetables will be really fresh and in-season! Congrats again!!! Good for you! It is so important to take care of oneself even though I know that can be hard. But in the long run all the hard-work will more than pay for itself!!! Way to go! I know how hard it is to get started. You look great and you sound like you feel amazing! Keep up the great work. This is just great news! 18 pounds is fabulous and you earned every bit of it. Thanks for all the great tips. I think I will follow you and do a no sugar thing for two weeks. My post today is on same topic. i just lost my first ten poundspost baby.i hAve a lot to go but feel super motivated especially after your post. Thanks!! And that is exactly what will work! It's not hard, it just takes the desire to want to change. I've been doing the same thing since February (really March since I totally cheated through my birthday). Congratulations! You've done it right! Now get some rest...just one more day till you can sleep late! I'm so glad you did this post - very inspiring! You are looking fantastic and how exciting about wearing some of your favorite clothes again. I need to be better about my lunches - they are WAY larger than yours. :) Probably explains why my scale isn't budging! I am so proud of you. Changing the way you eat and working out is tough. I am a very healthy eater, but enjoy dinners out and drinks. I have always worked out so those nights out don't show up on the scale. Well, when I moved I didn't have a gym, it was too cold to run and then I hurt myself! Dumb me didn't change my eating habits...now I have a few lbs to work off. Gym tonight and 5:30 and tomorrow at 6 am. 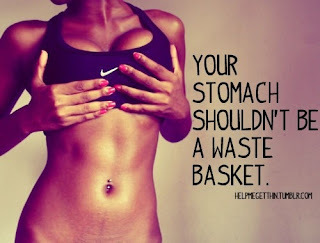 You'll reach your goal weight, although you already look fab! congrats to you!!!!!!!! that's an awesome accomplishment. 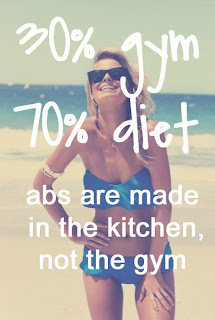 I really do think that especially for women the key to weight loss is eating well. I find that when I eat healthy I instantly get smaller than just working out. Boys have it so lucky...they seem to just work out and it goes away! Everything you said makes complete sense. 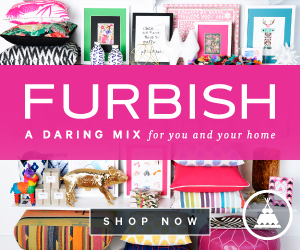 I liked your pinterest finds too! Keep it up! I am so happy for you! I agree that eating well is the key (which I don't do enough). I really found your post inspiring. I was doing well at the beginning of the year, but I'm afraid I've fallen off the bandwagon. I'm going to jump back on it, though! Congrats on the weight loss! 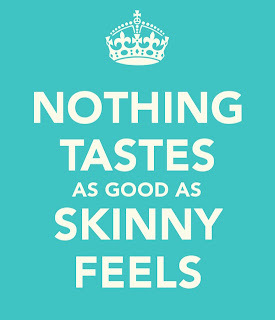 I love that quote "nothing tastes as good as skinny feels." I remember hearing something similar to that from a coworker in college - "nothing tastes as good as a flat stomach looks" and those words have stuck in my head for YEARS. I always allow myself the occasional splurge (sometimes you just need pizza) but also try to remember that when I want to pick up chicken nuggets for lunch just because I'm in a hurry. Proud of you girl! I had the same issue. oThere is nothing worse than having a closet full of amazing clothes and NOT being able to wear it! So frustrating. I gained close to 50 ish pounds throughout college. 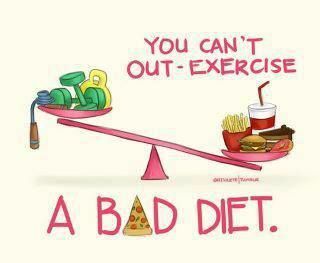 I completely agree that a diet can wipe out any good you do at the gym. I am happy to report I am down to what I was my sophomore year in high school. You can do it! Congrats on the amazing work, and I loved the post. Great quotes and great instructions! So awesome, good for you!! I agree, diet is huge. You've done amazing! Um I'm obsessed with this post. I also really want you to email me! But I was nodding along to most of this because I had a very similar weight loss plan my senior year of college that (for the most part - with a few 5 to 10 lb fluctuations) has stuck! You're right, it's a change in lifestyle. I do work out 6 days a week but my diet transformed, lunches are tiny like yours and dinner I allow myself a little more, but try to stay away from carbs. The hardest part has been and always will be cutting out the sweets. And of course, weekends are for indulging. So happy for you!! I've gained about 10 pounds since college and I've been trying hard since January to change my lifestyle. Many of the changes I have made are similar to what you have mentioned in this post. Good luck on your last couple of pounds! Congrats on your progress! You are doing so well but I love that you are also real about things and have a balance of being healthy but also enjoying life! I made a huge change when I graduated college and cut out a lot of dairy and switched to almond milk. I also no longer eat meat and rely on fish, legumes, and tofu for a lot of my protein. 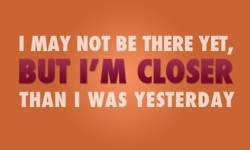 Are you running the 10k this weekend? I didn't sign up until 2 weeks ago but that has been a big motivator these past few weeks pushing me to get outside and run. It has been great to see my running habits change and increasing my milage. I need to do better about my diet. The last month has not been good with that aspect. Yay! Thank you for sharing this! I've been on weight watchers (off and on) since the beginning. I lost a few decent pounds, which is great, but I'm ready to switch it up a bit, and I know the best diet out there is to cut your carbs. 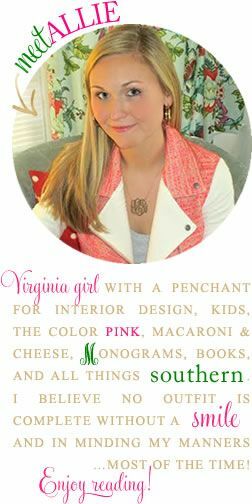 Keep it up, girl, and congrats on getting to wear your pretty Lilly dress! I am so impressed with your dedication to eating healthy! My best toning advice is to incorporate push ups into your workout. They're great because they require no equipment, you can do them at any time, and they get results fast in terms of toned arms. This is awesome. I love this post, Allie. Great work. I need to do some simple things, too. Congrats, all your hard work has paid off! I think your approach is the such a healthy (right) way to go! awesome motivation, i've been battling with my own habits for over a year now and this is just what I needed. I'll start taking walks tomorrow and hopefully fully adapt to a much healthier lifestyle! let's work hard together!! Resolutions Update and an April Fool!